Your baby is growing fast, and space is getting tight. He may wiggle if he gets uncomfortable. As he becomes more oriented in space, he may move to a head down position. Your baby can see, although the view from the uterus looks mostly like a dull glow when it is bright and just black when it is dark. Even this little difference in lightness helps him begin to adjust to the day and night cycle where he lives. He can also hear, although most sounds are muffled. He is already becoming accustomed to mommy and daddy’s voices, as well as the sounds that are familiar where you live. He is learning to feel comfortable with the music you listen too, other people you live with, pet noises and regular life around you. He can also taste, although the flavors of the amniotic fluid are subtle. What you eat can change the flavor of the amniotic fluid, so he is already becoming accustomed to the types of food you eat. His lungs are preparing for breathing, and his movements give his muscles exercise. There is tremendous brain and nervous system growth taking place this month. He is also beginning to be able to have some ability to regulate his body temperature. His bone marrow is now fully responsible for making his blood, and he passes about 1 pint of urine every day. The fat developing under his skin helps to smooth out the wrinkles as it gives him energy stores for the first few days of life. 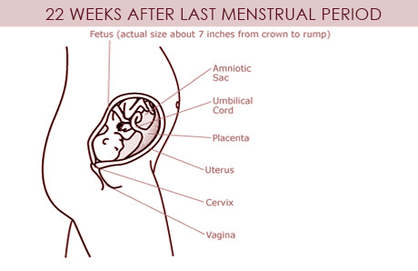 At the end of the 28th week your baby will be around 11 inches from crown to rump and weigh 3 pounds. As you make the move to the third trimester, the large size of the uterus is forcing it to take up room in the pelvic area again, which may bring back frequent urination. The increasing size of the uterus also may begin to cause some back pain. Good posture, low heeled shoes and pelvic rocking will help to minimize backaches. Your increased size brings with it some difficulty sleeping. Use extra pillows to make yourself comfortable, or try other sleeping arrangements such as a couch or a guest bed. Even if you are not leaking fluid, the colostrum has formed in your breasts. It is not complete, however. The antibiotic properties for which colostrum is famous will not appear until sometime during labor. Constipation and hemorrhoids may become a problem. Put a low stool under your feet as you use the toilet to realign your body in a gentler potty position.